I have been a fan of the Cobras conceived by Carroll Shelby since their beginnings in 1963. Carroll seized an opportunity and talked the English manufacturer of a small two seated sports car, AC Cars, into supplying the basic chassis and body. Almost simultaneously he convinced Ford Motor Company to supply a newly released light weight engine and transmission. The pieces (cars from AC and engines from Ford) were shipped to Los Angeles where Carol's crew assembled the car. The result was the Cobra. 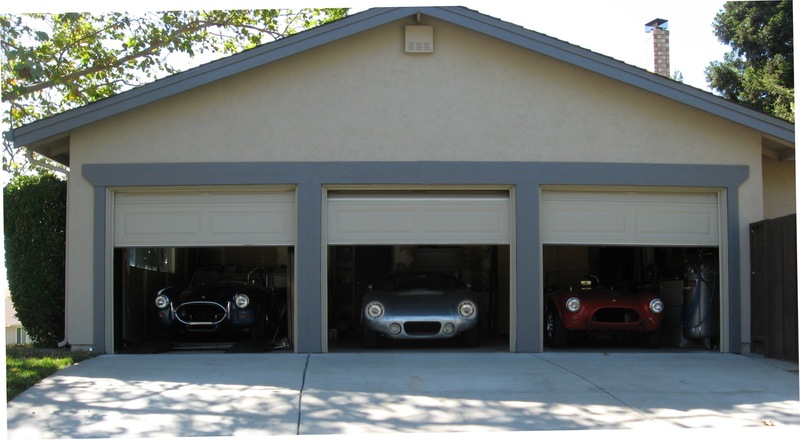 Over the years, I have been lucky enough to acquire each of the three main variations of the Cobra body styles. The purpose of this web site is to share information for these Cobra types; the 289 Cobra, the 427 Cobra and the Daytona Coupe Cobra. Although the majority of the site chronicles our Daytona Coupe project, I have also included additional information on our 289 and 427 Cobras as well as other Cobra related information. This site is becoming larger as time passes and I add more information. For those who are first time visitors, I hope you will take the time to browse through the complete site. For those enthusiasts that have have visited previously and would prefer to simply access new information, I have added this area which hopefully will provide faster access to new pages and information. New information is included in relavent sections of the site and is accessible simply by reading through the pages in the normal manner. However, the following links will provide direct access to the most recent updates simply by clicking on the descriptive text below. The "Date added" is approximately when the information was added. The "Summary" is a short description of the new information. Summary: CAD drawings providing details for adapter brackets suitable for installing a Jaguar Salisbury 4HU differential in an original Cobra chassis. Summary: Sketches for fabricating a small brake capable of bending 1/8" thick steel plate for brackets. Summary: CAD drawings providing details for fabricating an electric motor powered sheet metal shrinking machine. This site is broken into several major categories to provide some degree of organization. A short description of the sites areas is given below. Double clicking on the photos below or the Navigation Bar at the top of each page will take the visitor to the related series of pages. Our Daytona Coupe replica. 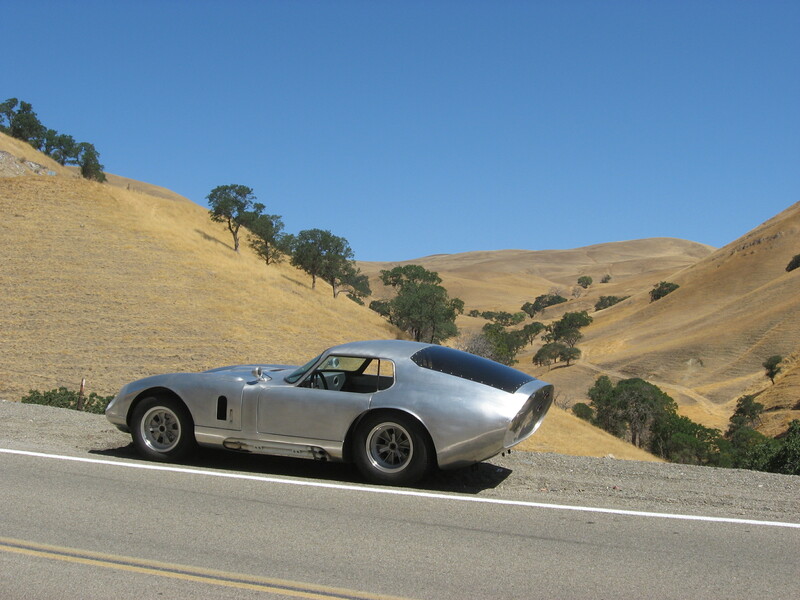 Only six Daytona Coupes were originally built by Shelby American in 1964 and 1965. The original was chassis number CSX2287. Chassis numbers 2289, 2300, 2601, 2602 and 2286 followed as rapidly as time and materials were available. These cars were purpose built for the sole purpose of defeating Ferrari on the high speed road courses of Europe. 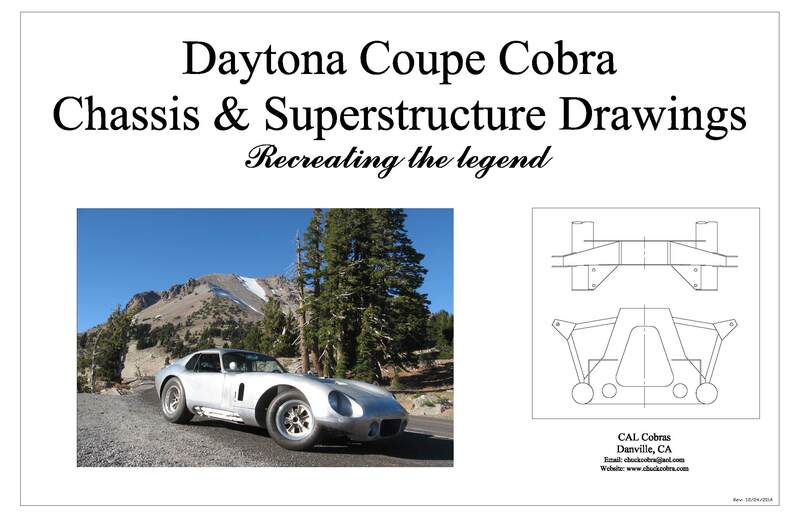 The pages in this section of the site will take you on a photo tour of the construction of my Daytona Coupe Cobra. The "Daytona Coupe" link at the top of the page provides more details on this car. CSX3193 is an original 1966 427 Cobra. It was initially sold from Hayward Ford, located in Hayward California. The early ownership history from 1966 through 1975 is a little sketchy but after consulting several sources, we have a relatively good understanding of previous owners. We purchased the car in 1975. When purchased, the car was cosmetically in relatively poor condition; however, it was a complete car. Over the first year or so, some minor body work was done and it was painted its current guardsman blue color. Unfortunately, the car is not driven as frequently as it used to be. The "427 Cobra" link at the top of the page provides more details on this car. Our 289 Cobra replica, "Red" for short. Shortly after purchasing CSX3193, I just knew I had to have another Cobra and set my sights on a Daytona Coupe. Since even at that time, the original Daytonas were financially out of the question for me, I decided to build one. Since the basic chassis of the Daytona is based on the 289 Cobra roadster and since there were many more 289 roadsters available for study, it seemed logical that if I couldn't build a roadster, the idea of a constructing an authentic coupe would be completely out of the question. Building our 289 replica completely from scratch gave me the confidence to tackle the Daytona. For several years it was driven daily as a commuter car and also participated in many of the local Shelby Club events. Red is still my favorite. The "289 Cobra" links at the top of the page provides more details on this car. This section of the web site lists most of the CAD drawings that I have prepared for my Cobras. Originally the drawings were pepared to document my projects for my own use and entertainment. However, I am now make them available to other enthusiasts for their personal use. I have created over 400 individual parts and assembly drawings. Included here are all of the drawings that are presently available for the Cobras as well as some examples of the CAD drawings. The "Cobra Construction Drawings" link at the top of the page provides more details on this information. This is just a portion of the Cobra documentation that I've gathered over the years. Presently included in this section are copies of the original 289 and 427 Cobra Owners manuals as well as some older sales literature relative to Cobras. I hope to add to this section as time permits. 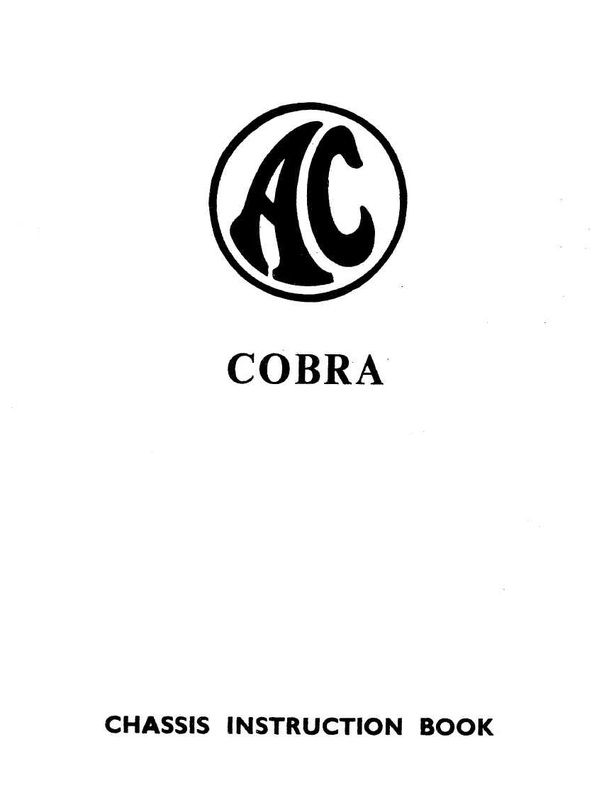 The "Cobra Manuals" link at the top of the page provides more details on this information. The "Cobra Videos" link at the top of the page provides access to these short videos. This section of the site is catch-all for anything else Cobra related that seemed important to include. The initial document includes the details of the English wheel that I used for constructing my coupe. As time goes on, I hope to add other miscellaneous notes topics related to Cobras. 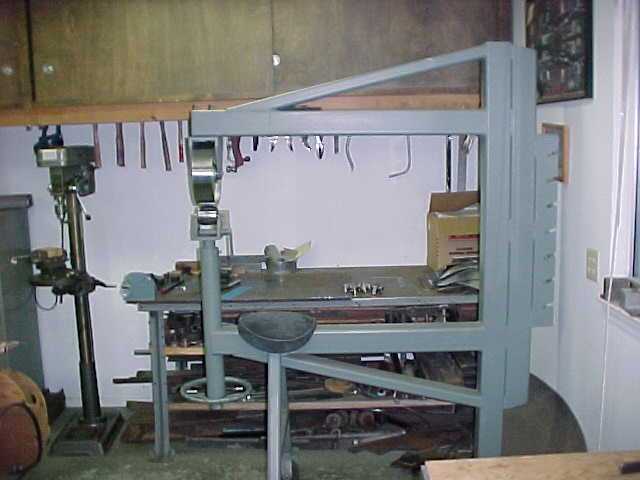 The "Miscellaneous Cobra Tools and Fabrication Stuff" link at the top of the page provdes access to this information. This section of the site sumarizes some of our more memorable trips in the Cobra. I try to get the Cobras out for a drive at least once or twice a week. Sometimes the drives have a particular destination, but more often I just follow the way the car is pointing. Certainly the Cobras made their mark on history at the race track, but the point of this section is to share with other Cobra enthusiasts some of the fun that can be had in simply driving and enjoying the car on a road trip. Our home in Northern California provides an abundance of roads to explore. The "Road Trips" link at the top of the page provds access to these photos.